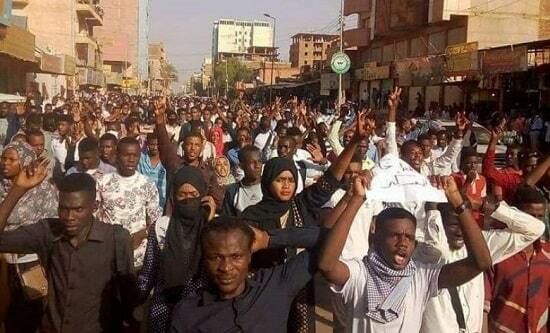 The ongoing mass protests in Sudan that began in Atbara on 19 December 2018 are some of the longest and most widespread since the country’s independence from Britain in 1956. They were triggered by cuts to subsidies for bread (the nation’s main food staple) and have turned into broader anti-austerity protests, from which a country-wide anti-government struggle has quickly emerged, calling for the overthrow of president Omar al-Bashir. Protesters have set fire to the headquarters of Bashir's National Congress Party (NCP) in two locations, thrown stones at banks, demonstrated outside police stations, gone on strike and marched to the presidential palace to submit The Declaration of Freedom and Change. They have been met with government repression. Security forces have used tear gas and live ammunition to disperse and kill protesters, leaving more than 40 people dead. More than 1,000 have been imprisoned. Bashir has declared a state of emergency.